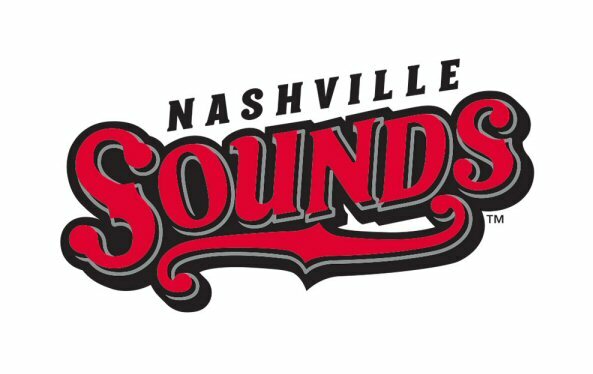 The Nashville Sounds had a successful hit making season this year. On September 9th, 2016 they played the third of a five game series against the Oklahoma City Dodgers. The two teams both with one win each on Friday were in contention for the number one spot in Minor League Baseball’s Pacific Coast League. An enthusiastic crowd was present to support the Sounds at their initial post season home game at First Tennessee Park located in the Capital District of Nashville, Tennessee. The game was close most of the night with the Sounds ultimately winning a thrilling 6 to 5 victory. The PCL playoffs moved to First Tennessee Park in September. Music City has a long history with professional baseball that dates back to 1885. It began with the Nashville Americans with a number of name and division changes over the years. In 1978 the Nashville Sounds started as an expansion team in the Double-A Southern League. The name is a play on the term “Nashville Sound” a late 1950’s subgenre of country music associated with the great music players in the city. The team has been a farm club for seven major league teams. In 1980, The Sounds were the Double-A affiliate of the New York Yankees. Managers Stump Merrill (1980-81) and Johnny Oates (1982) and future major leaguers such as Steve Balboni, Don Mattingly, Buck Showalter, Otis Nixon, Willie McGee, Pat Tabler, and Dan Pasqua helped lead Nashville to first or second-place divisional finishes from 1980 to 1984. Currently the Nashville Sounds are affiliated with the Oakland Athletics. The Sounds play at First Tennessee Park which opened on April 17, 2015 in the location that was the former Sulphur Dell ballpark that is memorialized here with a big green wall stating this site is one of baseball’s most historic parks. The stadium has corporate boxes, a wide concourses with direct views of the playing field along with the Band Box in the outfield which reminded us of an outdoor rec-room complete with couches and Ping-Pong tables. For a small fee fans can play miniature golf. Concession includes traditional ball park foods along with local specialties such as BBQ and hot chicken. Franklin Barreto’s triple got the late game comeback off and running. Also of note is the gigantic guitar shaped scoreboard that displays game information, statistics, player photographs and animations. Musical and historical imagery are incorporated throughout the stadium reminding patrons of Nashville’s entertainment and sports heritage. 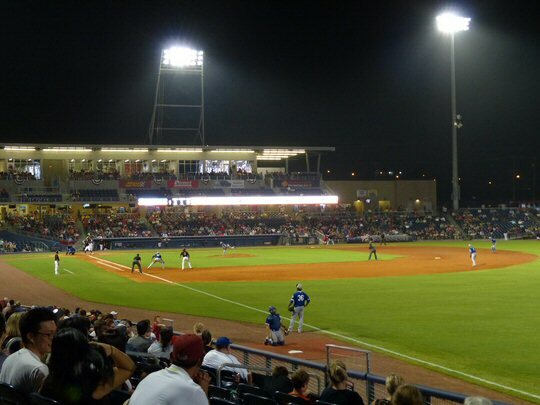 Interestingly, the plants and field at First Tennessee Park are maintained with rain water collected nearby so there is also an environmental element to the venue. The Nashville Sounds’ mascot is a rooster named Booster. He is bright red with tail feathers that resemble flames, a subtle nod to regional hot chicken. His name refers to his job which is “boosting” or building enthusiasm for the team. Booster along with giveaways games throughout the night kept the crowd in good spirits. The Sounds were host to a number of special guests on Friday. First the Marines who were in town for Marine week. Also the Little League Baseball team from Goodlettsville, Tennessee were given a warm welcome by Nashville fans for their impressive recent run in Williamsport. After player introductions the Marines presented the colors and Captain Skye Martin sang the national anthem beautifully leaving some thinking that a new star was born in Music City. 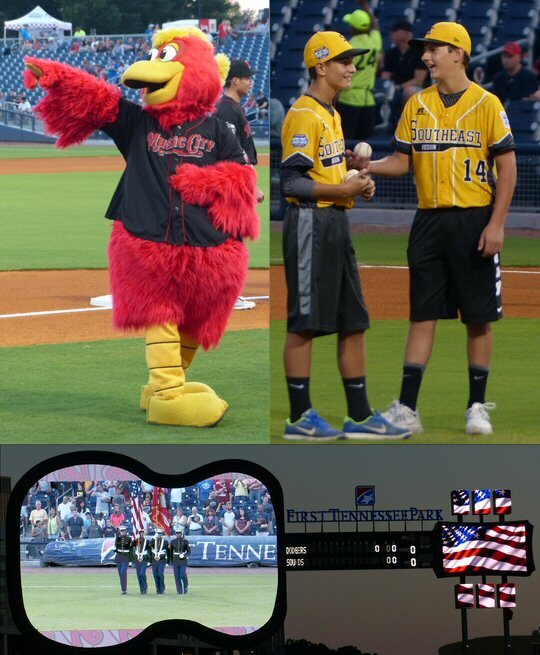 Pre-game activities included Marine Week, the mascot and Little League All-Stars. One of the noteworthy aspects of Minor League Baseball is that the pitchers have 20 seconds to throw the ball. There are also time limits for replacing players. We found this kept the game moving at a good pace. 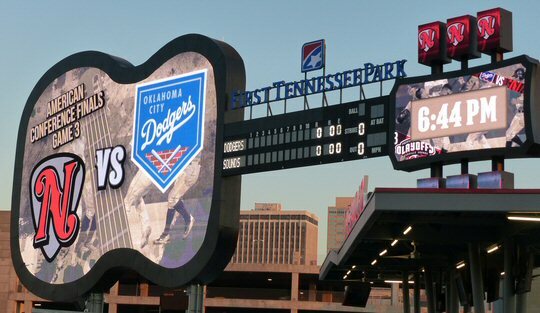 Something unique to The Sounds is that when a player hits a home run a “Goo Goo Gone” image is shown with a nod to the most famous chocolate in Nashville. 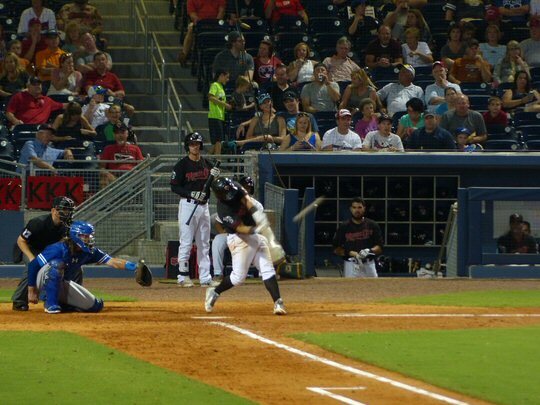 On Friday, the Sounds built a 4-0 advantage with a big four-run third inning but then the Dodgers took the lead as the Sounds’ pitchers were struggling. The home team rallied in the bottom of the 8th when shortstop Franklin Barreto got the late game comeback off and running with a triple deep to the centerfield gap. This helped the Sounds pull ahead to win the game 6-5. The festivities ended with a colorful display of fireworks. Yes, 2016 was a successful season for the Nashville Sounds. Even though they would go on to lose the best of five series to the Dodgers on Sunday night cries of “wait till next year” echoed throughout Mid-Tenn. We are already looking forward to 2017 when the Sounds will continue to play solid baseball in a modern stadium full of amenities, fun and history. The Sounds take the lead in Game 3 in Music City.